Welcome to this, the second part, in a brief series of posts on Mark Murphy’s argument for the weak natural law legal thesis (WNLLT). As explained in part one, the WNLLT is that human laws (acts of parliament etc.) are defective if they do not provide decisive reasons for action. As was also explained in part one, Murphy does not try to defend the WNLLT for all human laws in the first instance. Instead, he tries to defend it for mandatory legal norms first, before then moving on to other kinds of legal norm. (1) If a demand does not provide decisive reasons for action, then that demand is defective. (2) Mandatory legal norms are demands. (3) Therefore, if mandatory legal norms do not provide decisive reasons for action, they are defective. The argument is valid, so to see whether or not it is successful we need to evaluate its premises. As you can see, premise (1) is a claim about the conditions of success for a demand and premise (2) is a claim about the nature of mandatory legal norms. Murphy tries to defend both of these claims. Let’s see what he has to say. 1. Are Mandatory Legal Norms Demands? (4) In order for X to make a demand, X must be a speaker. (5) The law (or legal system) is not a speaker. (6) Therefore the legal system cannot make demands. And, as a result, all the norms that form part of the legal system cannot be classified as demands. Murphy does not take issue with the idea that only speaker can make demands. Part of me wonders why he doesn’t do so. I’m not entirely convinced that you need to be a speaker in order to make demands, but I accept I could be wrong about that. So I’m happy to follow Murphy and only consider the merits of premise (5). Contrary to premise (5), Murphy thinks that the law (or legal system) can be classified as a speaker. He admits that the legal system is not a paradigmatic speaker, but he thinks it shares enough features with a paradigmatic speaker in order for it to be classified as a speaker. Interestingly, this means he is adopting a non-essentialist approach to classification. In other words, it means he does not think that classifying terms refer to essential properties that are shared by all members of that class. This is interesting because, as we shall see in a moment, he might be adopting a more essentialist approach to the classification of demands. Thus, his defence of premises (1) and (2) might be in tension with one another. Anyway, we might illustrate Murphy’s argument by reference to the following diagram. The core consists of the paradigmatic members of the class of speakers, those who possess all the features we attribute to speakers; the penumbra consists of the non-paradigmatic members of the class of speakers, those who possess nearly all the features we attribute to speakers; and the periphery consists of borderline cases who possess some of the features of paradigmatic speakers. Murphy’s claim is that the legal system falls in the penumbra and thus can be classed as a speaker. This is to speak in the abstract, perhaps excessively so. 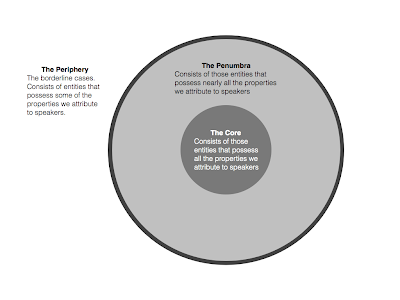 What are the properties possessed by paradigmatic speakers? Murphy mentions four: (i) they have beliefs; (ii) they have desires; (iii) they have normative standing, i.e. they must be open to moral appraisal for what they say; and (iv) they have causal efficacy to produce speech, i.e. they are able to issue declarations and make speech acts. The most obvious example of a paradigmatic speaker is, of course, a human being. 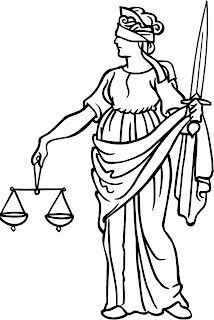 Murphy’s claim is that it is plausible to say: (a) that the law has normative standing (it can be morally appraised); (b) that it has causal efficacy (it can issue declarations and speech acts); (c) that it has beliefs and desires, albeit ones that are distributed across the human officials who make up the legal system. Thus, although it does not have the same properties as paradigmatic speaker, the law comes pretty close and it is right to call it a speaker. (7) In order for X to be classed as a speaker, it must possess all (or come close to possessing all) the following features: (i) beliefs; (ii) desires; (iii) normative standing; and (iv) causal efficacy. (8) The law (or legal system) comes close to possessing all four features. 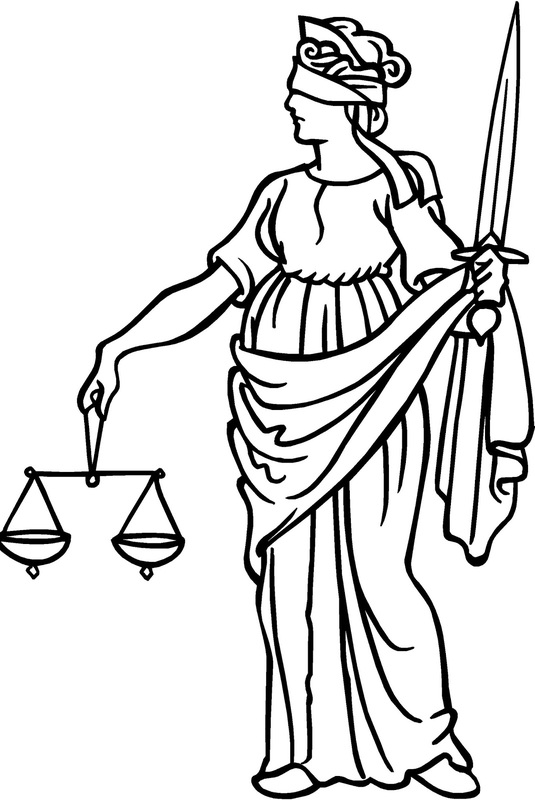 (9) Therefore, the law (or legal) system is rightly classed as being a speaker. And therefore (5) is false. This is only half the battle. We’ve provided reason for thinking the law is a speaker, now we must provide reason for thinking that mandatory legal norms are demands. Fortunately, the argument for this is much briefer. 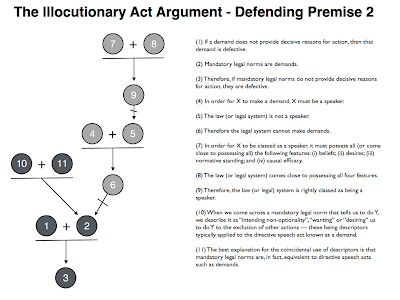 It starts by noting that a mandatory legal norm is best described by attributing to it all the features we would attribute to a directive speech act such as a demand. For example, when we come across a legal norm forbidding murder, it seems right to say that the legal system in issuing that norm “intends” for us not to commit murders, “wants” us to not commit murders and so forth. These are all the descriptors we would apply to someone asking us to close the door. What’s the best explanation for the similarity of these descriptors? 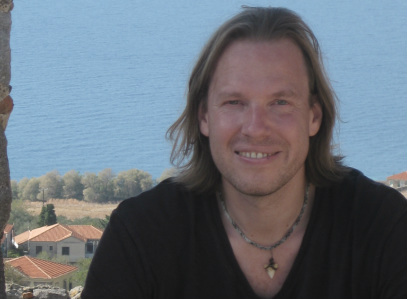 Murphy argues that the best explanation is that they are essentially the same kind of thing. 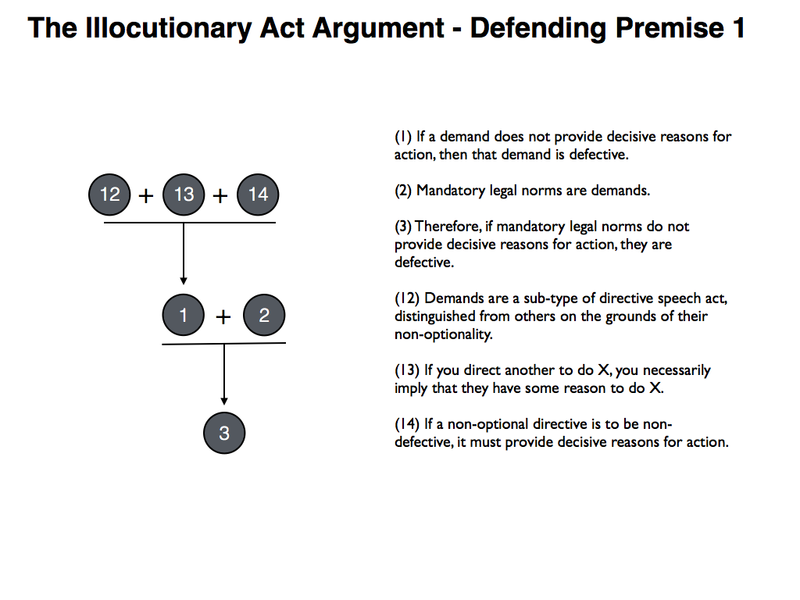 (10) When we come across a mandatory legal norm that tells us to do Y, we describe it as “intending”, “wanting” or “desiring” us to do Y — these being descriptors typically applied to directive speech acts such as demands. (11) The best explanation for the coincidental use of descriptors is that mandatory legal norms are, in fact, equivalent to directive speech acts such as demands. (2) Therefore, mandatory speech acts are demands. The observant among you will note that (2) does not actually follow from the combination of (10) and (11). 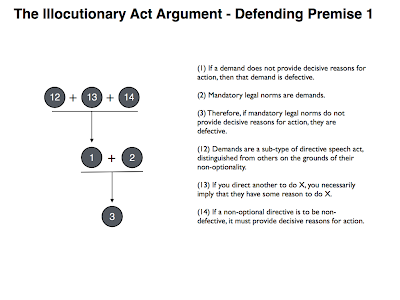 That’s because (10) and (11) don’t speak directly to what distinguishes a demand from the other types of directive speech act. This is easily fixed. What distinguishes a demand from, say, a request, is that the former is intended to be non-optional whereas the latter is not. So if we include “intended to be non-optional” among the descriptors of mandatory norms, we do get an argument that supports (2). This is done in the diagram below. Premise one claims that providing a decisive reason for action is one of the conditions of success for making a demand. I introduced the idea that speech acts had conditions of success attached to them in part one. To repeat the example I gave at the time, to make a successful assertion, the proposition that is asserted must be true. If the proposition is false, then your assertion is defective in some way (it doesn’t fail to be an assertion, it just fails to be a proper assertion). So why should we accept that a successful demand must provide decisive reasons for action? Murphy offers the following argument. It has two parts to it. First, it claims that providing reasons for action is condition of success for making a directive speech act. And second, it distinguishes demands from other kinds of directive speech act. As noted above, the distinction seems to be that demands are non-optional. So then we ask: what would make a non-optional directive defective? The answer, according to Murphy, is: by not providing decisive reasons for action. 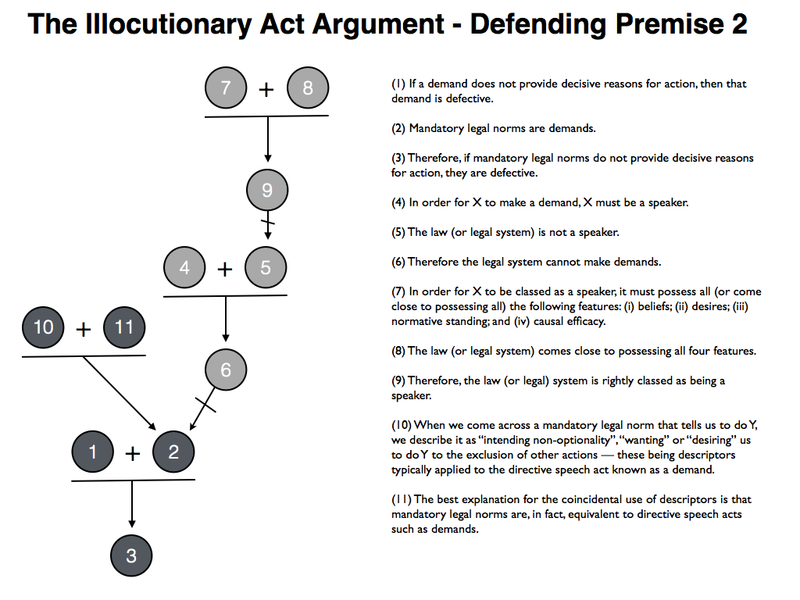 (12) Demands are a sub-type of directive speech act, distinguished from others on the grounds of their non-optionality. (13) If you direct another to do X, you necessarily imply that they have some reason to do X. (14) If a non-optional directive is to be non-defective, it must provide decisive reasons for action. (1) Therefore, if a demand does not provide decisive reasons for action, then that demand is defective. To be fair to him, Murphy tries to offer some support for each of the premises in this argument (his version of this argument is slightly more complex). He supports the first part of (12) by referring back to Searle’s taxonomy of speech acts and noting that demands seem to fit clearly within the directive branch of this taxonomy. He supports the second part of (12) by just referring to examples and arguing that non-optionality seems, obviously, to be the distinguishing mark of the demand. More interestingly, he offers two lines of support for (13). The first line comes from a survey of all directive speech acts. If we perform such a survey, it seems obvious that all directive are designed to present another agent with reasons for action. The second line of support comes from something called the “Paradox Test”. Murphy asks you to imagine ordering someone to bring you a book while at the same time denying that this gives them any reason to do so. Murphy claims that this is obviously absurd and self-defeating. Thus, it must be the case that directives necessarily imply reasons for action. The Paradox Test then forms the basis of the support for (14). The idea being that denying that a demand is supposed to give decisive reason for action would be self-defeating or absurd. With each of the premises defended, it seems like Murphy can claim that his original argument for the WNLLT is sound. As noted at the outset, Murphy’s illocutionary act argument for the WNLLT, in the form discussed here, only covers mandatory legal norms. There are, of course, lots of other types of legal norms such a power-conferring laws or legal rights. Murphy would like for the argument to be extended to cover these other norms as well. Indeed, he tries to do this in the relevant chapter of his book. I won’t get into the full version of the extended argument here. Roughly, the idea is as follows. Other types of legal norm can be classified as other types of speech act (for example, a “right” can be classified as a “commitment”). These other types of speech act also have conditions of success attached to them. And, as luck would have it, providing decisive reasons for action is one of the conditions of success for these other types of speech act too. I won’t try to evaluate this extended argument here.